So, here I am. Buying myself some space. Literally. 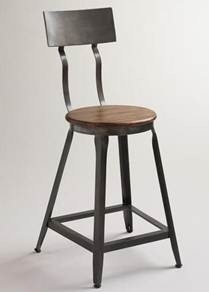 An area of furniture that doesn’t reflect the old me, but the me I want to be. 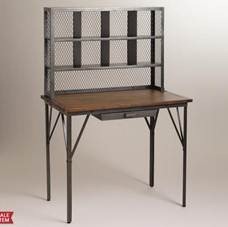 I always look at industrial furniture and think “If I just had that San Francisco loft overlooking the view of the Farmer’s market”, I would buy furniture like that. Nope, not any more. The chances of me living that dream without serious action on my part, are slim. So, I’m creating my own artist’s space at home. I’ already have the super cool vintage dresser for my tv, and a great start on cool art for the wall. But I went bigger and did the furniture too. I may need to replace the curtains and couch after this, but at this point, I took the plunge and…ooh, the water feels oh-so-good. I bought all of this from Cost Plus World Market. It’s a counter height desk and chair, something I will feel very “fashionista” in and that will also take my line of sight out of my normal view – not only giving me the new point of view I need in my creative space, but also make me feel less like I have to clean my already organized space up in order to procrastinate further. The chair is perfect for my sitting style. I like to curl up. Being a near 6 foot tall chicky though, I need some space for these pins, k? 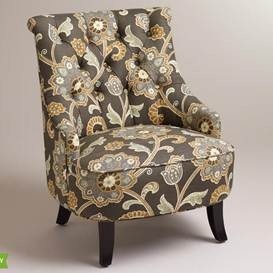 So this arm chair that’s near armless, will allow me my urban sprawl space that I need. (require.) I also forewent (is that a word?) 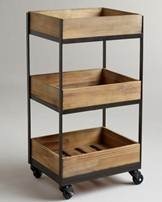 the traditional side table and got a wheeled cart that can transition between desk and chair to hold my crafting supplies so that they are tucked away, but remind me every morning I pass them, to GET ON THIS PROJECT NOW. It’s not here yet, but my excitement already is seeping through. I’ve undone the areas and moved furniture around to get maximum exposure to this new look. I’ve gotten projects out of the closet and started organizing what will go where so that I can insure some “quick wins” (read: half done projects to get done and done-erer) will be had! I’m excited to have a space I love. I’m glad I took the plunge. Hopefully these creative spaces will shine through to this space on the webs! Happy Tuesday, and here’s to finding your space. This entry was posted in Home Fashion. Bookmark the permalink.